Model: Dell Latitude E7270. Storage: 256GB SSD. 128 GB mSATA Solid State Drive. 4GB DDR3L RAM. 1.6GHz max turbo 2.6GHz. Two 1W stereo speakers. Spill Resistant Touchpad & Backlit Keyboard. Realtek High Definition Audio with Waves MaxxAudio 3. Mini DisplayPort. LATITUDE E6230. This laptop is in good condition with signs of wear including scratches and imperfections on casing. You will receive 1 laptop with no accessories. Specs as follows 128GB SSD (Solid State Drive). Latitude E7250. SSD (Solid State Drive). Software/Data Recovery is not covered under Warranty. Hard Drive. It's made to last and it's truly the largest difference between the stuff you "can get" and the stuff you must have to change the way you compute. Standard signs of use. We would be happy to assist further as needed. Tested for full functionality. R2/Ready for Reuse. Boots to BIOS. Battery:Not included. Model: Latitude E6230. Series: 3320M. Type: Core i5. Type: DDR3. Form Factor: Laptop. All manufacturers' warranties are void unless otherwise stated. Item Location. This unit includes an AC adapter. Dell Latitude E7280. 1920x1080p Touch Screen. 12.5" LED Screen (1920 x 1080). Windows 10 Pro. USB-C, USB 3.0, HDMI, SD Card Reader. 12.5in FHD. 256GB SSD (Solid State Drive). Hard Drive. Expires August 20, 2020. Screen is in excellent condition. Unit is in good working condition. Software/Data Recovery is not covered under Warranty. Model: Latitude E6230. Included: Laptop and Battery only (as pictured). Hard Drive: Not Included. Not Included: Hard drive, Battery, HDD Caddy, AC adapter, HDD Adapter, manual, software, OS or drivers. Refurbished - Dell Latitude E7270 Ultrabook (P26S). Model Latitude E7270 (P26S). SSD Drive 512 GB. Power Adapter Dell laptop carrying bag (new). Other Wi-Fi, Ethernet, Bluetooth, Headphone Jack, SD Card Reader, HDMI, mini DisplayPort. Dell Latitude E7250. It's made to last and it's truly the largest difference between the stuff you "can get" and the stuff you must have to change the way you compute. Whether it's a laptop, desktop, LCD, printer or one of our other amazing deals, each piece is coming to you off-lease. Dell Latitude E7250 laptop is loaded with Windows 7 Professional 64-bit. • Model: Latitude E7250. • HDD: 256 GB SSD (msata). • RAM: 8GB DDR3. • Screen Size: 12” Screen with 1366X768 resolution. • 3x USB 3.0. USB-C, USB 3.0, HDMI, SD Card Reader. LATITUDE E6230. This laptop is in fair condition with signs of wear including scratches and imperfections on bottom of case. You will receive 1 laptop with no accessories. Specs as follows 128GB SSD (Solid State Drive). Series: 2540M. Model: Latitude E6220. Type: Core i5. Form Factor: Laptop. All manufacturers' warranties are void unless otherwise stated. Item Location. This unit does not include hard drive. There is hard drive caddy included. Series: 3540M. Model: Latitude E6230. Type: Core i7. Type: DDR3. Form Factor: Laptop. All manufacturers' warranties are void unless otherwise stated. Item Location. This unit includes an AC adapter. 512GB SSD (Solid State Drive). Unit may show normal wear and tear (Scuffs or scratches). 1920 x 1080 ( Full HD ). Windows 10 Professional Reset to Default Factory Settings. Windows 10 Professional. WiFi Module Built-in. The Dell Latitude E6220 Notebook PC has a 4GB DDR3 RAM enabling you to multitask easily without affecting speed of the computer. It features a 12.5 in. Dell Trusted Platform Module 1.2. 500GB Hard Disk Drive. 4GB DDR3 RAM (upgradeable to 8GB). Laptop is in great used condition with normal signs of wear including light scratches and scuffs. Unit has been tested and is working 100%. Genuine Dell AC Adapter is included. Latitude E6230. 128GB SSD ( Solid State Drive ). Hard Drive / SSD. 4GB (2 x 2GB) DDR3. Windows 10 Professional 64 Bits. But still we take our item back within specified warranty period. Keyboard Type. Dell Latitude E7240. 8GB RAM, 256GB SSD. Dell Latitude E7250 12.5" touch Screen. Storage: 256gb SSD- even though the screen says HHD the BIOS is wrong. Screen in Good Condition no dead pixels or issues. battery good. So any other details would have to be answered by the manufacturer based on the serial number and or part number we are providing. This is our SOP, for us to be certain and for record purposes. We might require you to send us photo/s of the item received and also your original item so we can compare and conduct necessary actions. The laptop has been refurbished and is ready to use right out of the box. TOSHIBA PORTEGE WINDOWS 7 TABLET LAPTOP. 250GB Hard Drive. Toshiba Disc Creator & DVD Player. Finger & Stylus Touch. The laptop will go through a final test phase after the sale is complete. 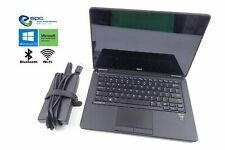 DELL Latitude E6230 12.5" Notebook Core i5-3340M @ 2.7GHz, 4GB RAM, No HDD/OS. Extended Life Battery included. HDD not included. HDD connector & caddie not included. Preowned item, was in anexcellent working condition before the Hard drive was removed, now boots to Bios. The screen is in perfect condition (no dead pixels), Keyboard & Touchpad in working condition. Model: Latitude E6320. Included: Laptop only. Hard Drive: Not Included. Not Included: Hard drive, Battery, HDD Caddy, AC adapter, manual, software, OS or drivers. We have since grown to be a large scale electronics recycling, asset recovery center. Refurbished Dell Latitude 5280 12.5" Laptop, with Windows 10 Pro. See further specs and actual pictures below. Base Dell Outlet Latitude 5280. Network Interface Card Dell Wireless 1820 802.11AC Dual-Band Wi-Fi BT 4.1 Wireless. Hi Guys, 1. You are looking at a great laptop in clean working Condition with minor sign of daily use. 2. Laptop will come with Dell Original charger and battery. 3. Laptop will come with windows 10 and Free installed Microsoft Words trial version which can be upgraded. 4. Laptop bought from wholesale public auction, please note that WARRANTY IS NOT TRANSFERABLE. 5. Laptop is great for personal use, students and businesses. 6. Refer to pictures for detail information and let me know if you have any questions. Buy with complete confidence. Thank you for your patronage!!!. Dell Latitude 7280. Model Number: SAMSUNG SSD PM871b M.2 2280 128GB. 128 GB SSD. Model Number Latitude 7280Search for Similar. Display Size 12.5 LCD with 1366x768 resolution. Built in Bluetooth. Max Clock Speed: 2.64 GHz. 12.5" HD (1366x768) LED-backlit LCD Panel. Display 12.5" HD (1366x768) LED-backlit LCD Panel. Manufacturer Warranty. 4GB RAM at 1600MHz. All key characters will be legible. Pricing on grade B products will typically be lower than grade A products.